Duke typically has a good basketball team and this vintage of Blue Devils is even better. Zion Williamson is the truth and he’s got a really nice supporting cast around him including RJ Barrett and Tre Jones. The Blue Devils made it through a recent tough patch in good shape and look to be back to where they were before the shoulder injury suffered by Tre Jones. Duke is having trouble shaking a couple of their challengers atop the ACC rankings—they’re in a three way tie for first place with Virginia and Louisville—but being who they are they really don’t even need to win the conference tournament to lock up a cushy NCAA bid. They just need to keep winning. Even so, this looks like a tough spot for the Blue Devils from a pointspread perspective. They’re playing their final non-conference game of the season at Cameron Indoor Stadium and laying a ton of points to a pretty good St. John’s team. The Red Storm aren’t exactly tearing things up in the Big East this year (4-5 in a tie for fourth place with Seton Hall) but they’re 16-5 overall. They’ve got a lot of confidence heading into this matchup with Duke since they beat them at Madison Square Garden last year 81-77 as +11 underdogs. Red Storm guard Shamorie Ponds shredded the Blue Devils for 33 points. At the time of the St. John’s upset of Duke at MSG the Red Storm had lost 11 straight games entering the contest at 10-13. The Red Storm are much better this season and Ponds is still tearing it up. He leads the team in scoring (20.9 PPG), assists (5.7 per) and steals (2.8 per). Ponds has a stronger supporting cast this season and the team as a whole shoots the ball well (.477 FG%). Junior guard Mustapha Heron has been very strong lately averaging 18.3 PPG over the Red Storm’s last four games. For most teams, this would be a ‘revenge spot’ based on the loss at MSG last year but not Duke. 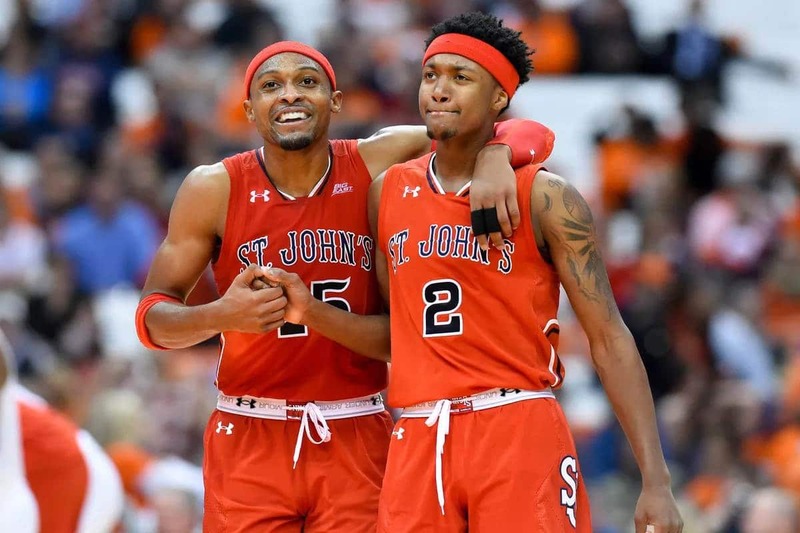 For one thing, the current roster had little to do with last season’s loss to St. John’s—players no longer on the team accounted for all but four points in that game. More significantly, Duke has ‘bigger fish to fry’ both on a micro and macro level. The macro of course is the NCAA tournament and a potential championship run. The micro is a brutal scheduling stretch that begins next Saturday against #3 Virginia in Charlottesville. During that stretch they’ll face UVA, #15 Louisville on the road, home games against #23 North Carolina State and #9 North Carolina, then they’ll finish up the month with what will be a big ‘revenge’ game at Syracuse followed by another road game against #12 Virginia Tech. That makes this game against a dangerous non-conference foe a tough spot for the Dukies. They’re in the midst of an uninspiring part of the schedule where they’ve faced Georgia Tech, Notre Dame and Pittsburgh as double digit favorites. They’re double digit favorites here and they’ll be double digit favorites at home against Boston College on Monday. It’s impossible to keep up the kind of intensity necessary to cover big numbers night after night even for a top flight team like Duke. The Blue Devils have covered just two of their last six games. St. John’s is good enough to keep this score reasonable and shoot well enough from outside (.385 from 3 point range, tied for #25 in the country) that Duke won’t be able to extend a huge margin. St. John’s is very much ‘on the bubble’ for a NCAA tournament berth and a decent showing here can only help their case. Duke has not lost to a non-ACC team at home in nearly 20 years with 146 consecutive wins. Their last loss game on February 26, 2000 to…..St. John’s. Can history repeat itself? Probably not, but history can cover the spread.